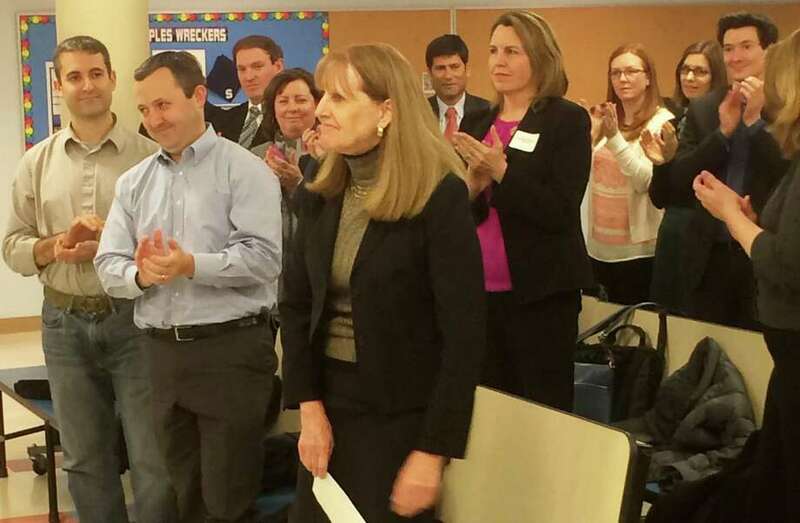 The audience at Monday's Board of Education meeting applauds Colleen Palmer, foreground, after the board officially named her the next superintendent of Westport's schools. WESTPORT — The search for a new superintendent and Staples High School has begun. In the wake of Staples Principal James D’Amico’s announcement on March 8 that he will become principal at New Fairfield High School and Superintendent Colleen Palmer’s resignation a week later, the Board of Education has established search committees to fill the two senior school positions. “I fully anticipate we will follow similar processes we’ve used in the past, but may make some variations,” BOE Chair Mark Mathias said, noting any changes will be decided by the committees. Board members will lead both search committees with Karen Kleine and Elaine Whitney in command of the superintendent search, and Candi Savin and Jeannie Smith at the helm of the search for a new Staples principal. While the full membership of the principal search committee has not yet been determined, the superintendent search committee will consist solely of the seven education board members. Palmer, the board announced Monday is “out until further notice” due to a medical emergency, will not be involved in the search for a new superintendent, Mathias said. Parent Teacher Association Council Co-President Carolyn Caney, meanwhile, said she hopes the search includes many stakeholders involved with the schools. “The PTA would really like to see a broad representation of community interests on the search committee,” Caney said. She hopes members of the Representative Town Meeting, Board of Finance, special education community, TEAM Westport, building administrators and PTA are included in the search. “I think the district is really splintered right now and I would like to see a new superintendent come in and really heal the district,” Caney said. No deadline has been set for the searches, Mathias said, adding a new superintendent would usually begin at the start of the academic year on July 1, but that its not practical to choose a new permanent superintendent by that date this year. “We’ll probably have an interim superintendent for next year. I don’t know whether we’ll go for an interim principal next year. There’s a big question mark there,” Mathias said. The board may hold off hiring a new Staples principal for a year to allow the new superintendent to be part of the hiring process for the principal, Mathias said. However, if the education board finds the right candidate for principal, they could be hired for the next school year. The BOE launched the same searches just four years ago, which culminated in the appointment, in 2016, of D’Amico to Staples principal and Palmer to superintendent. Hazard, Young, Attea & Associates, a national education search firm, was hired to conduct the last superintendent search, which cost the district $28,511, according to schools Chief Financial Officer Elio Longo. For the last principal search, the board hired Cooperative Educational Services at a total cost of $7,467, Longo said. The board has not yet decided on which search firm it will hire to find the new superintendent, Mathias said.